Starting in Windows 10, version 1607, administrators and driver developers can use a registry setting to block legacy file system filter drivers. Legacy file system filter drivers are drivers that attach to the file system stack directly and don't use Filter Manager. 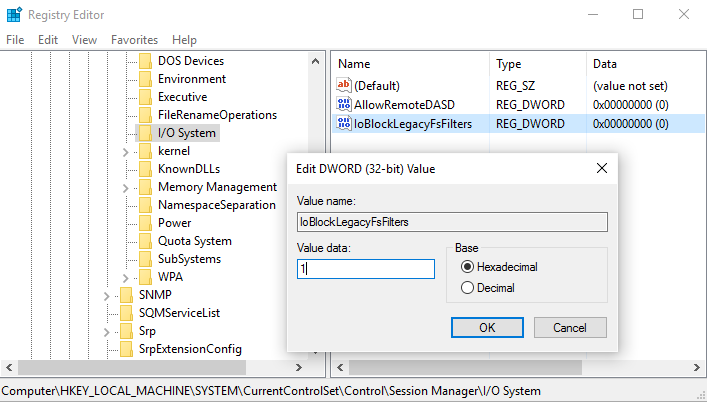 This topic describes the registry setting for blocking and unblocking legacy file system filter drivers. It also describes the event entered into the System event log when a legacy file system filter is blocked and how to check if the OS has legacy file system drivers running. Note For optimal reliability and performance, we recommend using file system minifilter drivers instead of legacy file system filter drivers. Also, legacy file system filter drivers can’t attach to direct access (DAX) volumes. For more about file system minifilter drivers, see Advantages of the Filter Manager Model. To port your legacy driver to a minifilter driver, see Guidelines for Porting Legacy Filter Drivers. Use the IoBlockLegacyFsFilters registry key to specify if the system blocks legacy file system filter drivers. When blocked, all legacy file system filter drivers are blocked from loading. For the registry changes to take effect, perform a system restart. 1 Legacy file system filter drivers are blocked from loading or attaching to storage volumes. 0 Legacy file system filter drivers are not blocked. In this release, this is the default behavior. Open an elevated Command Prompt by right-clicking a cmd.exe icon and clicking Run as administrator. Look for legacy drivers, they're the ones with a Frame value of <Legacy>. In this example, the legacy file system filter drivers, named AVLegacy and EncryptionLegacy, are marked with the <Legacy> Frame value. The file system driver named AVMiniFilter does not have the <Legacy> Frame value because it is a minifilter driver (it does not attach to the file system stack directly and uses Filter Manager). If you see that legacy drivers are still running after you block legacy file system filter drivers, make sure you reboot the system after setting the IoBlockLegacyFsFilters registry key. The setting will not take effect until after a reboot. If your system has legacy file system filter drivers, work with the respective ISVs to get the Minifilter version of the file system driver. For info about porting legacy file system filter drivers to minifilter drivers that use the Filter Manager model, see Guidelines for Porting Legacy Filter Drivers.